There is no known translation of Nafaalilargus' name in the Dragon Language, although the "faal" in his name translates as "the". Its name also has more than the usual three syllables found in most other dragon names. The alternative spelling of "Nahfahlaar" spells out two words in the Dragon Language, "Nah" meaning "fury", and "fah" meaning "for". 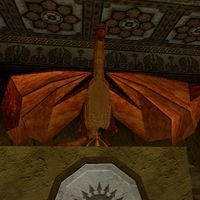 Nafaalilargus may simply be a Cyrodilicized version of his real name, as he served under the Empire during the events of Redguard.